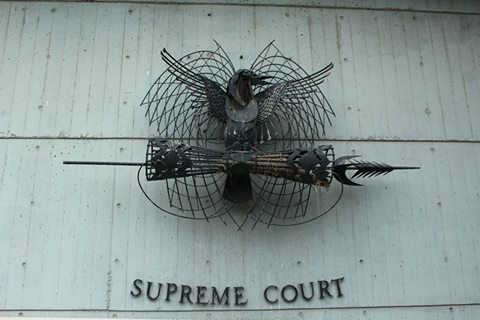 The Supreme Court has issued a stunning indictment of large-scale resource extraction projects in PNG, labelling them as ‘large scale frauds committed against the true and correct landowners’ in a judgement delivered on September 25. The Court singled out the PNG LNG project for special mention as one where the State and the ‘developers’ have failed to obtain free and informed consent and a social licence for their operations. The case before the Court concerned trespass and illegal use of customary land by logging giant Rimbunan Hijau, and the court endorsed an earlier award of damages of more than K6 million against the company. What happened here is in fact a sad story that is repeated throughout the country over a long period of time from the colonial administration in the name of opening up wild frontiers for various so called developments and projects. The so called projects and development covers from logging, prospecting for minerals and oil and gas to actual mining, to oil and gas developments to other customary land base developments like the famous or infamous Special Agriculture Business Development Leases (SABLs). What is happening in most cases is that, developers and the State alike are failing to either deliberately or by inadvertence to first ascertain, then properly organise, empower and deal with the properly identified and confirmed customary land owners. Rather than taking this most important first critical step, the State and the developers are entering customary land and are proceeding with their activities and in so doing, choosing to and are indeed dealing with persons who claim to be landowners when in fact they may not be the true and correct landowners… The State to the extent that it is doing nothing about this practice is encouraging this improper and illegal approach by so called developers which in fact is a large scale fraud committed against the true and correct landowners by the so called developers with the support of the State and in collaboration with persons claiming to be owners when they are not. Kandakasi J., in his decision in the P’Nyang and Kanga Kawira cases correctly calls them “fraudsters and thieves.” As was noted by his honour in his judgments, the PNG LNG project presents a clear case on point. In this project, despite s. 47 of the Oil and Gas Act, both the State and the developers have failed to properly identify the true and correct landowners, properly organising them into ILGs, enable the landowners to fairly and meaningfully enter into negotiations with the developers and the State and for the developers and the State to seek and secure from the true and correct landowners through their duly elected or appointed leaders the landowners free and informed consent and approval and ultimately, their social license to operate. The contracts or agreements and the deals the State and developers enter into with persons not properly identified and appointed by the landowning clans, or groups, remain null and void ab initio or void and of no effect from the very beginning. Given that, when the true and correct owners eventually assert their ownership rights and exercise their rights, challenging the contracts or deals with the fraudsters and or thieves, they must give way. Such contracts do not bind the true and correct landowners. If need be, the State and or the developer concerned need to enter into completely new contracts with the true and correct landowners on terms that are fair and reasonable with reasonable compensation being paid for the earlier illegal entry, occupation and conduct of their businesses. Definitely seems the initial exercises have been flawed so corrective measures must be taken now. Corrections now will give the future generations no more of the burdens and headaches we are experiencing now. Court should now impose declaratory orders to halt all operations in timber, lang, mining, etc till true landowners give social license for fair equity n benefit..freecarry… They own resources in the first place so why pay equity to participate?? ?..makes absolutely no economic sense!! !